Welcome to Warship Models Underway! Click on the above to find out the latest site changes! A site for the builder of large scale, radio controlled model warships! 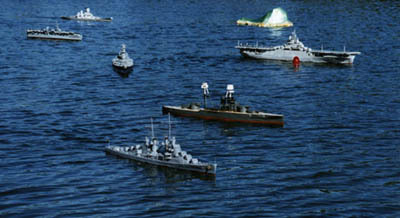 The goal of Warship Models Underway is to promote the hobby of radio control warship modeling. 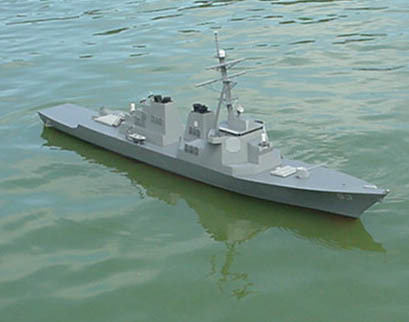 Although the content is primarily focused on the warship modeler, there is plenty of information here on building a working r/c ship model. Even if you don't intend to build a ship right now, take a look at our extensive galleries for a bit of inspiration! Have questions? Try our discussion board, or email me. Please enjoy the site - Kurt Greiner, Webmaster! Warship Models Underway is brought to you by these fine companies. Please support them! If you woudl like to support Warship Models Underway, and plan to make a purchase through Amazon.com, clicking through the link below will help! Take a look at my model - in - progress, the USS John Paul Jones. How to's and construction tips on working with fiberglass hulls and more. Look at the Image Gallery! Now with over 40 pages! Your submissions are always welcome! Product Reviews can be found here. Be sure to visit our Links page! Full of resources.